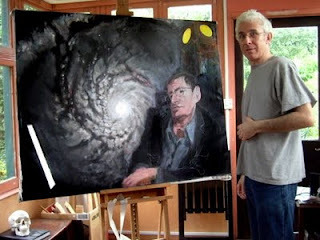 The Art of Yves Messer: Hawking's portrait: Time Flies! I like this expression "Time Flies" because, it is true! My time for the last year has been so hectic and difficult but who am I to complain? I wished I could have completed the portrait of the author of "A Brief History of Time" sooner but I am afraid it 'll take a bit longer. Luckily I am at this present moment in a better situation for my mind to focus. Of course, not being a scientist, just a layman my approach to these questions is more "intuitive" i.e. "visual". "What I cannot create I do not understand" said Physicist Richard Feynman as quoted by Hawking in his "The Universe in a Nutshell" book. So this is how I am trying to understand Hawking: by being creative. With a fresher approach I have decided to change its composition (again!) while immersing in the amazing world of General Relativity and Quantum Mechanics. Time is key in this new composition as it is in our lives or in Hawking's. In his case, time is vital and essential at both a personal level (he was supposed to have died many years ago) and at a more fundamental conceptual level. And both meet in the same person: Stephen Hawking. Life's short. Knowing we could all die at any time, what would you do? He decided to focus on what's most important: to try to unlock the mysteries of the Universe, while still alive. Nothing less. It reminds me the ancient Greek philosopher Plato who said "Time is the moving image of Eternity". No wonder it is precious.